Zelen's central thesis  was that patients receiving exactly the same treatment within a trial that they would have received outside of a trial did not necessarily need to be aware that they were in a trial. He therefore proposed what became known as Zelen's single consent design, which is illustrated in Fig. 4.2.
who are allocated the standard treatment, which they would have received outside of a trial, are not told that they are in a trial and so do not have an opportunity to refuse. Those who are allocated the new treatment are told that they are in a trial, and that if they choose to remain within it they would receive the new treatment. 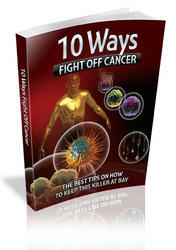 The doctor is then able to explain about the treatment and its side effects. The patient may refuse the new treatment for any reason and would then generally receive the standard treatment. Because the number of patients who can refuse to be in the trial is reduced, the number being randomized is increased, possibly considerably. This would benefit future patients in that the trial is completed, and the conclusions become available and can be implemented, more rapidly. However, there are both ethical and practical concerns with this design. The first concerns the need to analyse a trial in a way which avoids the introduction of bias, and the core of this is analysis by intention-to-treat, namely the process by which each patient randomized in a trial is analysed according to the treatment they were allocated, whether or not they actually obtained that treatment in full or part. This is discussed further in Section 9.4.1. 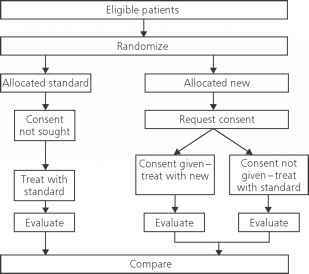 In Zelen's single consent design, this means that patients allocated the new treatment must be analysed in this group, whether or not they consented to the treatment. Clearly, if a substantial proportion of patients allocated a new treatment refuse it, the comparison of the two groups becomes somewhat muddied. The sample size calculation must take this into account, and if the refusal rate is such that the increase in sample size necessary to enable the size of difference anticipated between the two groups to be estimated reliably outweighs the increase in sample size obtained through limiting the consent process, nothing has been gained. There is therefore a reliance on the tendency for patients to adhere to the treatment they are first told about -and even perhaps pressure on the doctor advising the patient to give information in a way which encourages them to view the new treatment more favourably than they might had the consent process taken place at a time when a patient must be willing to receive either treatment. A further issue is one of data privacy- data on the standard-arm patients must be collected and held centrally for analysis. If the trial is to be analysed in an unbiased manner, then the minimum data required to enable the main outcome measures of the trial to be analysed are required at least. Thus there is a sense in which no patient can withdraw entirely from a trial. However, patients who have actively objected to being part of a trial may well be unwilling to attend for investigations which are necessary to determine a specific outcome measure. If data on an outcome are missing, then that patient is effectively excluded from the analysis. Finally, on a practical note, it is clearly not possible to carry out blind/masked trials with this design. The single consent design is widely used in screening trials, for example the occult blood screening trial for bowel cancer . Here subjects may be identified from GP lists and randomized to receive an invitation to be screened or not. As patients would not be offered screening outside of the trial, and as the outcome measures and further data required are no more than would be obtained for routine audit, this design has been considered acceptable. In addition, this type of approach means that control patients truly represent patients in normal clinical practice. This can be particularly important in, for example, trials of dietary intervention, in which knowledge of the trial's experimental arm, and the effect that the intervention is hoped to have, may lead the control group to alter their diet anyway. 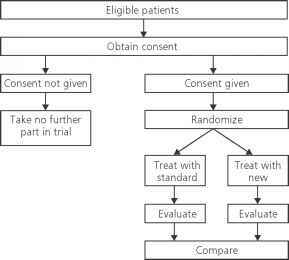 However, in the context of cancer treatment trials, most sponsors and many ethics committees require all patients entered into a trial to give informed consent and so this design has not been widely used in treatment trials. To get around this problem, a design known as the double randomized consent design was introduced . In this, the procedure up to and including the point of randomization is as above. However, patients in both arms of the trial are told they are in a trial and which treatment they would receive if they remained within it. Again they may not wish to give their consent to stay within the trial. It is not always clear which treatment a patient allocated standard treatment might receive in this situation, since the new arm may not always be open to them. The same ethical issues remain as above, in terms of the ability of a patient to withdraw entirely from a trial once randomized. In addition, the potential problems with analysis and interpretation remain. There are now opportunities for patients in both arms of the trial to refuse their allocated treatment. If half the patients in each allocated group refuse their treatment, and if refusers are given the 'other' treatment, then the two randomized groups become indistinguishable in terms of treatment received, and an analysis by intention to treat is pointless. Even much lower degrees of refusal can have a substantial impact on the sample size required. The calculation takes the following form. Thus, for example, a refusal rate in both arms of 10 per cent requires the overall sample size to be increased by a factor of 1.56 to maintain the original power to detect the same underlying treatment effect. Altman et al. discuss these issues in greater depth. In surveying the use of randomized consent designs in cancer, they found that most often they were introduced part way through trials which were struggling to recruit, but rarely increased accrual to an extent which compensated for the dilution effect. This suggests a limited role for such designs in cancer treatment trials.